A well-known Chinese proverb describing the relationship between the central government in Beijing and its people says, “Heaven is high and the emperor is far away” (天高皇帝远, tian gao, huang di yuan). It’s not too far of a stretch to apply the same proverb to the current state of China’s environment sector, where relatively strong pollution control laws are poorly enforced on the ground. On March 12, Chinese environmental activist lawyer Wang Canfa spoke to the China Environment Forum and a group of U.S. policymakers and NGO leaders at the Wilson Center as part of the U.S.-China Partnership for Environmental Law, a project by Vermont Law School and USAID. A short, smiling man suited in a pale pink blazer and matching navy tie with rose-colored specks, Wang’s affable nature belies his stature as the leader of China’s preeminent environmental legal aid NGO. He founded the Center for Legal Assistance for Pollution Victims in 1998, which has gone on to directly assist pollution victims in more than 220 cases, and he was named a “hero of the environment” by TIME in 2007. Wang discussed China’s environmental regulations and the government’s response to climate change. He said that while the government has taken steps to mitigate pollution, far more work needs to be done. 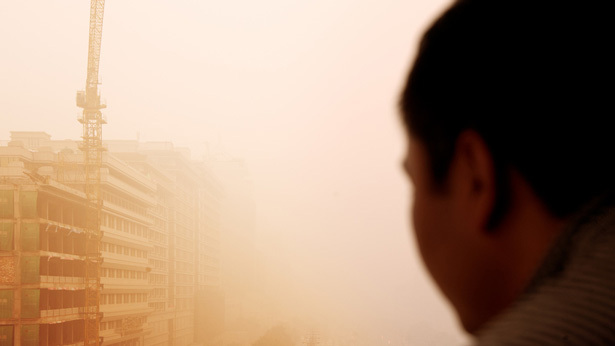 China’s environmental problems have hit the world stage recently. The oppressive gray smog covering Beijing in January made global headlines as it soared past hazardous levels. More recently, more than 13,000 dead pigs were found in a Shanghai waterway that supplies 20 to 30 percent of the city’s tap water. Although the source of their deaths remains a mystery, one popular explanation trending on Weibo, China’s version of Twitter, is that the pigs committed suicide because they couldn’t stand the terrible air. In response to high-profile environment fiascos such as these, Beijing has issued a spate of new environmental regulations to rein in polluting industries, Wang said. However, by the time this stream of regulations reaches China’s western hinterlands it’s often but a trickle. “As provinces such as Guangdong and Jiangsu have implemented stricter environmental measures, many companies have relocated westward to places such as Guangxi where there is less enforcement,” he said. In 2000, the government announced its “Go West” policy, a set of preferential investment conditions for 11 western provinces which have lagged behind in development compared to their eastern counterparts. Since then, there have been numerous reports of high-polluting industries moving west. In the Xinjiang Autonomous Region, ethnic minority Uyghur residents have reported “unbearable headaches” due to severe pollution from nearby copper mining. Last year in Guangxi, cadmium, a toxic metal used in batteries, was found in the Longjiang River in concentrations 80 times the official limit. The incident cut off water to 100,000 people, threatened supplies for millions more, and caused a panicked run on bottled water across the area. Another challenge is that the weakness of China’s environmental standards is relative, Wang said. Contrary to the popular Western narrative of China as the manufacturing center of the world, environmental regulations and implementation are actually quite strong in China compared to some of its neighbors, which has caused some Chinese companies to begin moving their operations abroad. “When I met with Cambodian NGOs,” Wang said, “they told me, ‘China has a lot of environmental law and regulations. But now Chinese companies are coming to Cambodia and ruining our environment and displacing our people.’” Chinese hydroelectric and mining companies have displaced local populations and polluted the surrounding environment there, Wang said. Although there are few reliable statistics, environmental degradation caused by Chinese companies operating abroad has been widely documented in the media. As a result, these days Wang said he spends a significant amount of time traveling to Vietnam, the Philippines, and Cambodia. The Center for Legal Assistance for Pollution Victims trains local leaders in these countries on environmental advocacy and how to encourage community engagement, in part to help them counter increasing levels of pollution from Chinese companies, but also to share general experiences and lessons learned. By building an international network of environmental advocates, Wang hopes to strengthen environmental advocacy across the region. In recent weeks the Chinese government has issued a flurry of calls-to-actions including a potential carbon tax, higher fuel standards, and restructuring of the National Energy Administration. While Wang views these measures – prompted in part by media coverage, both inside and outside of China – as important, he believes that a fundamental paradigm shift is needed. But Wang said that the government could take advantage of its own centralized structure to easily incorporate stricter standards. Despite China’s continuing problems, Wang said he is flying to Laos in May to speak with NGOs there on lessons learned. “We are a tiny organization; most of our staff is part-time. You see, I’m aging quickly,” he said. Besides, as the movement of heavy polluters in China and across borders has shown, the region’s environmental standards are only as strong as its weakest link. Susan Shifflett is a program associate for the Wilson Center’s China Environment Forum. Sources: The Atlantic, Bloomberg, China Daily, Chinese Law Innovation News, Circle of Blue, The Economist, The Irawaddy, The Guardian, NBC News, The New York Times, Radio Free Asia, South China Morning Post, The Telegraph, TIME, Weibo. Photo Credit: “Silk Road #2,” courtesy of flickr user Jonathan Kos-Read. Video: “Reign of Sand: Blackwater Inner Mongolia/China,” courtesy of Circle of Blue/China Environment Forum.